SMT, who later became Eastern Scottish, were a regular sight in Newcastle, they shared several routes into Scotland with United, and this one is discharging its passengers at the drop off point in the Haymarket Bus Station. There were three different routes to Edinburgh, and two to Glasgow. Morning departures on the Edinburgh routes were United vehicles, with SMT covering the afternoons, and vice versa from the other end, and I think it was the same for the more direct route to Glasgow. However, one of the Glasgow routes was a very long drawn out affair, with a running time of over seven hours. If memory serves, the vehicles met a point which was roughly half way where a refreshment stop was taken, the crews would then swap vehicles and return to their start point, but the vehicles would carry on and return the following day. It was also the case that in the event of a breakdown, the other company would provide a replacement, so presumably an arrangement existed with the insurance which allowed the other companies crews to man the vehicles. They were in abundance in Scotland, but this type of Alexander body never caught on south of the border to the same extent as the later ‘Y’ types, although North Western did have a few. Personally, I thought they were not a million miles away from the Park Royal body of the period. On the point of driver change over on the "long" Glasgow route, I have a feeling that the same thing happened at Penrith on the Manchester/Liverpool to Glasgow/Edinburgh services. Something similar happened on the X2/X60 group of interconnected routes: (Great Yarmouth)/ Nottingham/ Manchester/ Blackpool). This is Prudhoe Place just south of the Haymarket Bus Station in Newcastle. The building in the background was a cinema (and if we could so what film was being advertised we could probably date the photo). Just to the right of the camera was the famous Mobile Canteen MC2 (and was there ever an MC1?). Buses that were going to lay over usually dropped-off passengers here and then parked on the other side of the stand, rear-end inwards. This was also the pick-up point for Tynemouth 5 and United 8 during the afternoon peak period until all New Coast Road buses moved to St Mary’s Place in the late 1960s. The Edinburgh routes via Otterburn (9 later 508) and Wooler (15 later 510) were irregular. There was an Edinburgh SMT bus that left Edinburgh at about 09.00 for Newcastle via Otterburn and then returned via Wooler mid-afternoon. There was also an Edinburgh SMT bus that left Edinburgh at about 10.30 for Newcastle via Wooler and returned at 16.45 via Otterburn. Edinburgh crews worked both buses right through. There were only a couple of 5 minute stops en route. The Edinburgh route via Berwick (12 later 505/6) was hourly south of Berwick and more or less hourly north of Berwick. There were only a couple of 5 minute stops en route. As far as I know United buses worked through to Edinburgh but usually had SMT crews north of Berwick. SMT buses worked through to Newcastle but usually had United crews south of Berwick. However some of the scheduling was quite complex: buses might meet and swap crews at Niddrie Cross Roads, just outside Edinburgh, to get the crew back to Berwick before the end of service. 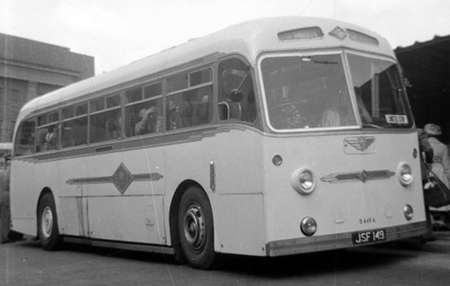 The Glasgow route (14 later 515) was once a day in winter and twice a day in summer. It was very slow and had a 45 minute stop at Galashiels. The buses worked right through but met at Galashiels where the crews swapped over. The United crew was, latterly, from Whitley Bay. There were also summer Saturday express journeys, that took about 5 hours, on which the crews worked right through, and came back the same day. At Glasgow holiday period there were often lots of duplicates and crews from a variety of depots north and south of the border. Scotland definitely had its own culture, which included labels on bus windscreens, as shown in this photo. Why it was normal, north of the border, to use labels to show the route and destination I never could work out. Were there too many destinations and route variations at each depot to include on one blind? Paul Robson makes mention of paper stickers on the windscreen for the service/destination. Surely this is preferable to showing ‘SERVICE’ or ‘DUPLICATE’ as mentioned in another thread which is on the go at the minute. Good on yer Scottish Bus Group. At the old National Express/Shamrock and Rambler Coach Station (77 Holdenhurst Road) the toilets were situated at the rear of the booking hall. The passageway had a huge rack (like a postal sorting rack for letters) that held yellow paper destination labels for literally all the served destinations in the South of England together with such labels as "On Hire To". I remember seeing one London label being held up (cheekily) by a hitchhiker on the Ringwood Sour Road. Newcastle services were run by SMT until 1964 under service nos 230, 231, (Berwick), 270 (Jedburgh) and 273 (Kelso) with other nos for services on these routes purely North of the Border. Glasgow – Newcastle/Whitley Bay was 252. Glasgow Scarborough was also a joint service on Fridays, Saturdays and Sundays with a night service from Glasgow on a Friday, returning North on Saturday night. I really must most strongly disagree with Alexander "having started building clones." they built their first coachwork in 1921 a number of years before Park Royal were even formed; and while they were happy to build to another coachbuilder’s outline when required (a rather awful Park Royal look for SBG from 1955-7 or a rather old-fashioned Weymann outline for Glasgow in 1953-5) they built to their own too, and the Eastern Regal IV is entirely a product of Drip Road Stirling. The use of of the word clone in relation to Leyland bodies implies they were building to a Leyland outline to win custom; in fact they built utilities and postwar double decks to Leyland outline because Leyland body production had been halted by the government because Leyland was needed to make tanks; Alexander were in fact operating with Leyland’s blessing and full co-operation. Leyland chose three bodybuilders for prototype Tiger Cubs, they were MCW, Saunders-Roe and Alexander, and when the coach version of the Tiger Cub was planned all of the Leyland prototypes including the one that lapped MIRA at 80mph were bodied by Alexander. The bus prototype worked for Starks of Dunbar and then Londonderry & Lough Swilly Railway, still in service with the latter in 1975, not bad for a lightweight. Alexander designs are I would contend more often copied than Alexander copied other designs. Two further corrections: Contrary to David Oldfield the angled windscreen was available on R type double-deckers as late as 1999; secondly I got the start date of Alexander’s coachbuilding (initially at Camelon) a year early in the previous post, still Alexander were building bus and coach bodies in 1922 and Hall, Lewis only started in North West London two years later. Park Royal Vehicles was formed after Hall, Lewis’s liquidation by their major creditor in 1930; eight years after Alexander started. Incidentally the Lewis family also owned Northern Counties Motor and Engineering Company Ltd.
PRV didn’t do an Alexander A-type copy but there were quite a few from Roe, which were done using PRV frames, and it Alexander’s design of double curvature windscreen was used on a number of otherwise standard Park Royal and Roe products. Northern Counties of course copied the Panoramic J type for Yorkshire Traction.